Result: Fatorian and Obesity Union troops driven out of Texas. Siege of California begins. After the capturing of Texas by O.U. troops, this became the official flag of Texas. Though not the state flag of Texas any more, it was still used as a battle flag for the 8th Obese Rifleman Division of the Fatorian army, a regiment of fatties that lived in Texas prior to the UN invasion of Texas. UN Invasion of Texas On January 5, 2009, UN forces sieged Texas, currently the most obese state in America. The siege took 4 days, ending in a UN victory. On January 10, 2009, massive cargo planes dropped approximately 500 obese people into UN bunkers and bases in Texas. The fatties caused earthquakes and destroyed buildings, causing UN forces to retreat to New Mexico. A car smashed by an Obesity Union soldier during the Fatty Counter-Attack. Battle of Albuquerque On January 10, 2009, at around 5:30 P.M., the fatties launched an invasion of Albuquerque. The battle continued for about an hour, ending in a decisive UN victory. The fatties this time were hit by armor piercing bullets, which cut through lighter-weight obese soldiers' fat layers with ease, and the fatties couldn't dodge them bullets, and they had no guns, so the simply tried to squish the enemy soldiers. At the battle's end, General Ronald McDonald was almost captured by UN forces, but it was reported that he had escaped to Fatoria. In the battle, General Heinrich Reichenstein was wounded when a fatty, after being hit by a tank shell, exploded in his face. The fatty didn't die, and instead was sent flying, however, Heinreich was sprayed with over 850 pounds of methane gas, fat, and over 15 tons of diarrhea. The acidic crap melted his face and burned his nose. It is also believed that the methane gases were so strong, he got high as they went up his nose, so he may also have brain damage. He was honorably discharged from the war, and was sent to Germany for emergency medical treatment. The fatties retreated back to their stronghold in Texas, stopping every 5 minutes to eat 50 Big Macs, says farmers that saw the fatties retreating. The UN, at 6:25 P.M., began setting up guided missile cannons to bombard the stronghold in Texas. January 11 Missile Offensives On January 11, 2009, UN forces launched a massive missile barrage against the Obesity Union's Texas fortress. Around 500 guided missiles rained down on the fortress. Many of the fatties simply ate the missiles, but many of them got past the fatties. UN scout planes have reported that the fortress had been "annihilated off the face of this planet". French troops reported around 50 fatties dead, 250 wounded, and over 8 million pounds of fat lost. The Fatty Fortress was now nothing but a heap of charred rubble and debris and fat. The fatties had apparently retreated to California, another one of the, as statistics show, most obese states in America. British and Canadian forces were planning to attack California while the Germans and French blockade the state and Californian harbors to ensure the fatties cannot escape. Result: Fatorians driven out of the United States. Fatorian invasion of Canada and Alaska fails. UN invasion of Fatoria begins. Establishing the UN/Californian Border On January 13, 2009, British and French forces established a border along continental California. The border was walled, barbed wired, and guarded by troops to prevent O.U. and Fatorian troops from escaping California via the border. French and German battleships and cruisers and British submarines and aircraft carriers established a naval blockade along coastal California to prevent Fatorian naval reinforcements to the O.U. and to prevent the O.U. troops from escaping via the Fatorian navy. Battle of Vancouver On January 13, 2009, as UN forces were busy blockading California, Fatoria used this time to invade Canada. 50 Fatorian battleships, 20 cruisers, 1 aircraft carrier, and 2 submarines set sail from Port Fat-attack to Vancouver, British Columbia. As Fatorian ships moved closer to Vancouver, radars picked up signals of their fleet. Radar stations in Vancouver immediately sent the report of what they found to an intelligence center in Canada. The Fatorian invasion angered the UN nations, but many of them were too busy building the blockade to send a fleet or an air force to stop the invasion force in time. Canada, who had decided to stay out of the making of the naval blockade, sent ships and air units to combat the Fatorian fleet. The battle lasted 2 hours, ending in a Canadian victory. Though the Canadians, who were heavily outnumbered, lost over 6 battleships and 1 aircraft carrier, the Fatorians lost 8 battleships, 3 cruisers, 50 planes, and their aircraft carrier. Also, Admiral Long John Silvers of the Fatorian navy was captured in the battle as Canadian paratroopers dropped onto the leading battleship of the attack fleet. This battle was also the first naval battle since World War 2 that naval ships engaged in direct combat. Battle of Juneau On January 13, 2009, in early morning, Fatorian troops invaded Alaska. The Fatorian solders' massive body fat layers kept them warm in the freezing climate, and in a matter of hours they reached Juneau, Alaska. After a 25 minute fight, Canadian forces there surrendered. The Fatorians suffered around 12 casualties and 45 wounded. The Canadians suffered 32 casualties and around 67 wounded, along with 150 troops captured. The United States, which worships McDonald's and supported Fatoria, did nothing about the battle and really didn't care about Alaska's capture. Canadian Counter-Attack Around midnight on January 14, 2009, Canadian troops moved into Alaska hoping to recapture the state. The Fatorians fortified Juneau, currently the only city they controlled, which made it difficult for the Canadians to attack. The Canadians' artillery vehicles froze and malfunctioned while being moved to Juneau in the freezing Alaskan morning, and Canadian tanks were lost when a bridge they were crossing over collapsed, sending the tanks down into a frozen lake under the bridge, so the Canadians attempted an all-infantry assault on the Fatorian fortress. The Fatorians won a decisive victory against the Canadians; the battle caused all Canadian forces in Alaska to retreat to Canada. The Canadians suffered around 675 casualties, 850 wounded, and 800 captured in the battle; the Fatorians suffered around 234 casualties, 702 wounded, and over 5 million pounds of fat lost. British Naval Counter-Attack After the Battle of Vancouver, on January 14, 2009, the ships the Fatorian naval attack force had left were planning to retreat to Fatoria to get more ships. However, after the Battle of Vancouver, they had to spend the rest of the day repairing the ships that were too damaged to even sail back to Fatoria. The British sent 3 submarines from the Californian naval blockade to attack the Fatorian fleet, which was stationed near the Arctic Ocean (the Fatorians' body fat layers kept them warm even in freezing environments). The British fleet soundly defeated the remaining Fatorian ships. The British suffered 0 casualties, 0 wounded, and 1 submarine damaged; the Fatorian fleet suffered around 2,500 casualties, 250 wounded, 1 billion pounds of fat lost, and 5 ships destroyed. Espionage in Los Angeles In January 16, 2009, members of the British SAS elite team parachuted into Los Angeles, the Obesity Union's capital of California. The elite team stole classified information on Canadian invasion plans, and Fatoria and the Obesity Union's plans on how to escape from California back to Fatoria. The SAS was discovered by Fatorian guards, and before they could escape, a firefight insued. The British had 3 casualties and no wounded, while Fatoria suffered 7 dead and 12 wounded. The UN received the information, and planned a final assault on both Fatoria and California. Airstrike on Los Angeles After reading the plans, UN intelligence figured out that the main Fatorian base was in Los Angeles, the Obesity Union's capital city. On January 16, 2009, at around 10:23 P.M., German and French aircraft carriers deployed waves of fighters and bombers to attack Los Angeles. The bombing raid devastated the base. Over 3,000 Fatorians died, an estimated 2,000 more were buried under the rubble of the base. As British troops moved in, minor skirmishes occurred between Fatorian and British troops. Both sides won smaller battles, but ultimately the British drove the Fatorians out of Los Angeles and out to the coast. Battle of San Francisco British troops attacking San Francisco met heavy resistance in San Francisco, but ultimately the British beat the Fatorian troops back. The British suffered around 3,250 casualties, 5,785 wounded, and around 25 mechanized units lost. The Fatorians suffered around 3,780 casualties, 9,750 wounded, and around 50 million pounds of fat lost. Battle of San Francisco Bay As the Fatorians and Obesity Union troops and citizens retreated to the coast, the Fatorian navy, led by Naval Marshall Captain D, attacked the UN naval blockade. This extremely fast attack caught the blockade ships off-guard, causing the Fatorians to break through the blockade. The Fatorian transports picked up the Fatorians and fatties and transported them to Fatoria. At the same time, Canadian forces defeated the Fatorians at Juneau and recaptured Alaska. The Fatorian invasion force fell apart after this battle, causing the UN troops to win the war in the US. UN ships prepared to launch a final invasion of Fatoria. Bombardment of the Fatorian Coast Wanting to end the war as quickly as possible, UN forces set out immediately the day after the Fatorians retreated from the US. Field Marshall William Johnston and a large force of British troops, and Colonel Billy Mays with Canadian troops and artillery set out from San Francisco Bay in January 17, 2009. British ships bombarded the coast of Fatoria on January 17, 2009, destroying turrets, troops, and war vehicles. The fleet met minor resistance from 1 or 2 Fatorian battleships, but the ships were quickly destroyed and the assault continued. Battle of Fat Village On January 18, 2009, UN troops invaded a large village in Fatoria known as Fat Village. The village was known to have numerous war factories and bunkers in it, so, thought it was considered a village, it was a strategically good location to attack. UN forces soundly defeated the Fatorian troops there, capturing the village. Battle of Chubbyburgh (Also known as the Battle of the Bulge from the Fat People's Army) On January 19, 2009, UN forces were being pinned down by a Miltia/so called Communist group that was called the Fat People's Army or the F.P.A. The battle lasted over four hours as UN reinforcements arrived at last as F.P.A's stomachs covered a vast majority of the battlefield creating a massive bulge. UN armored divisions opened heavy fire upon the ever increasing and advancing bulge into submission as more tank divisions took the right flank defeating the then ever so shrinking bulge. As UN forces continued the assault on the F.P.A, a clear road into the city of Chubbyburgh was now made as the city was captured within that very hour. Treaty of Fatropia After being battered by UN military forces for more than a month and after both sides took heavy losses, Fatoria, on February 6, 2009, surrendered. The treaty they signed with the UN stated that all of their colonies and war machines would be given to the UN, and every McDonald's restaurant in the country would be closed down. Fatoria and the Obesity Union reluctantly agreed to the terms of the treaty, which was dubbed the "Treaty of Fatropia", as it was signed in the country of Fatropia, an island nation neighboring Fatoria. After Fatoria's surrender, the Obesity Union disbanded and went into hiding. On January 11, 2009, at around 9:35 P.M., Fatoria and the Obesity Union signed a treaty after the O.U. (Obesity Union) threatened to invade the independent state. Though Fatoria already considered the O.U. an ally, the O.U. feared that Fatoria would send their obese military (Fatoria's military consists of actual armed troops and war machines, though the troops are obese) to attack the O.U. in defense of the UN. After the O.U. sent obese troops out of Vietnam to Fatoria, Fatoria, after 45 minutes of fighting, finally got O.U. commanders to believe they were allied with them, though the O.U. demanded they sign an official treaty so Fatoria couldn't easily break the alliance later on. After losing several battles to the UN forces, Fatoria decided General Ronald McDonald was too incompetent to be the supreme commander of Fatorian forces. On January 17, 2009, Ronald McDonald was impeached from the military, and was court martialed after rumors got out of him sending war information to UN forces for money. The war has been criticized by some because of the UN "keeping da information on da down low dawg", as Senator Fiddy Cent of Rapville, a small country off the coast of Fatoria. The war's information has only been given to UN intelligence groups and Uncyclopedia. The UN, against the United Kingdom, Germany, France, and Canada's wishes, has even denied the war's existence to the public. 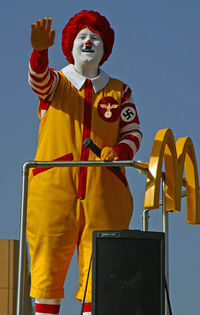 General Ronald McDonald during a war speech in Houston, Texas on January 9, 2009. This page was last edited on 31 May 2012, at 02:05.